His eminence with the delegation discussed latest developments in the political situation and the service of the city and means of supporting the future government to carry out its reform mission. His eminence indicated the importance of supporting the government in its mission, and that the Al-Hikma Movement had authorized The Prime Minister-designate to elect the most suitable members of the Al-Hikma Movement to join the cabinet, stressed that the support to the government will be continuing, whether Al-Hikma is part of it oe not. His eminence praised the Dhi Qar people whom had stood to defend Iraq and offered its sons in defense of Iraq, described Dhi Qar a city of history, originality and heritage, noted that the city deserves a better service for its oil, tourism and agricultural potentials, plus the marshes that are listed on the list of world heritage, and stressing the need for concerted efforts of all to serve the city and give priority to the public interest. 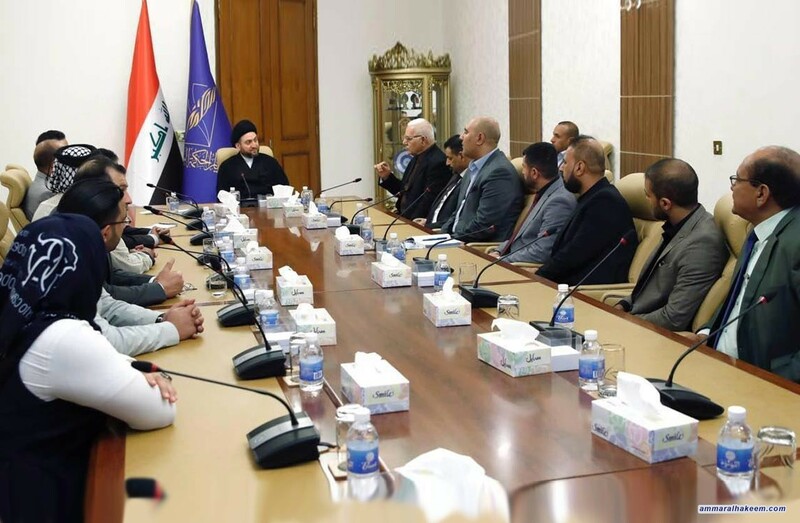 His eminence stressed the need to complete projects in the city such as the Nasiriyah Refinery and rehabilitation of roads that are described death, especially the roads of the city linking it to the south.